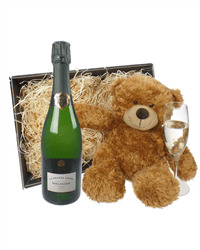 A single bottle of Perrier Jouet Champagne together with a fantastic cuddly loveable soft bear. 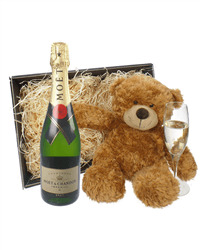 Supplied in a gift basket and personalized by adding your own personal message, this is a gift sure to be adored. 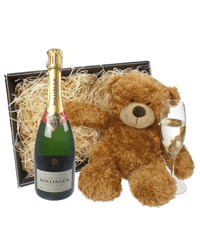 Send a cute, cuddly teddy bear and bottle of Champagne as a great gift for any occasion. 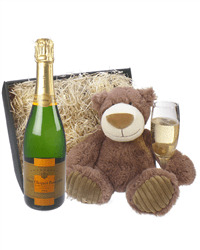 Our range of Champagne and teddy bear gift baskets includes such Champagnes as Lanson, Bollinger, Moet, Veuve Clicquot and many more. 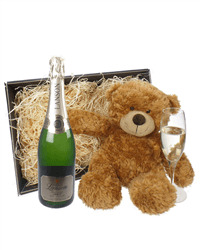 Order online or by phone and we will deliver direct to the address of your choice, packaged carefully with your special gift message.